Hi there, my darlings! Now I know I don't usually post on the weekends but there's a launch coming tomorrow and this one is a special one that you don't want to miss! 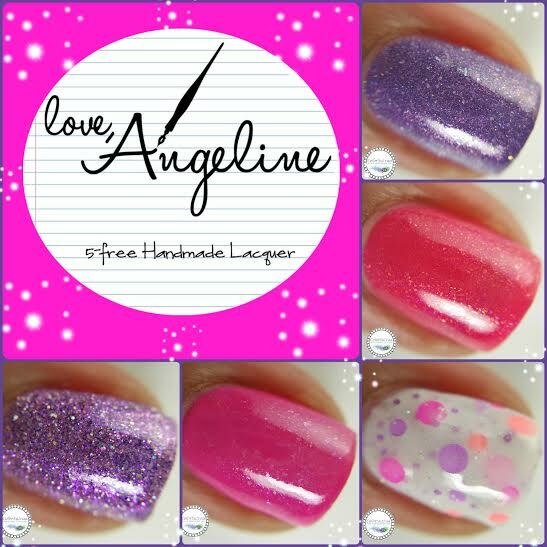 Love, Angeline makes its debut on the blog today with her absolutely gorgeous 3rd Anniversary collection and I'm excited to be sharing it with you all! You know this month marks ColorSutraa's own third year so I'm doubly excited to be celebrating with Natosha! 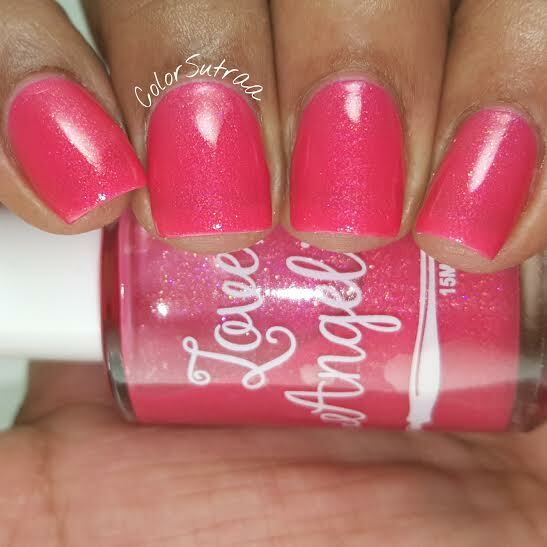 This collection consists of 5 polishes in bright fun celebratory shades--let's take a look! 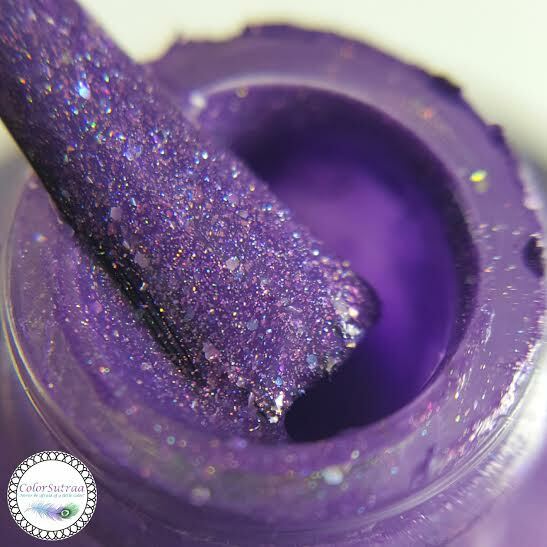 [ANNIVERSARY BLING] is described as "a lavender micro glitter with a flash of purple shimmer in there as well." 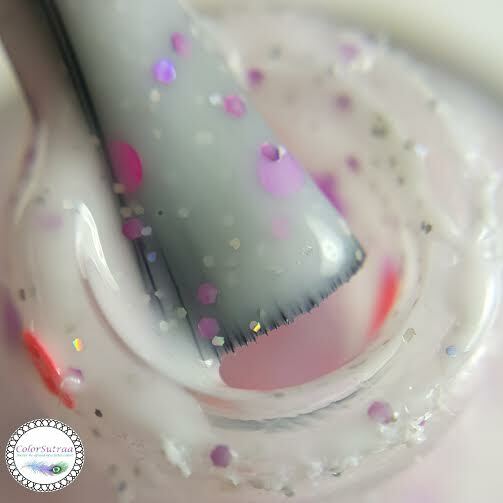 This one was a little on the thicker side and needs a bit of patience to apply--my advice is to wait til each coat is completely dry before applying the next. I'd probably sponge it on next time I use it. 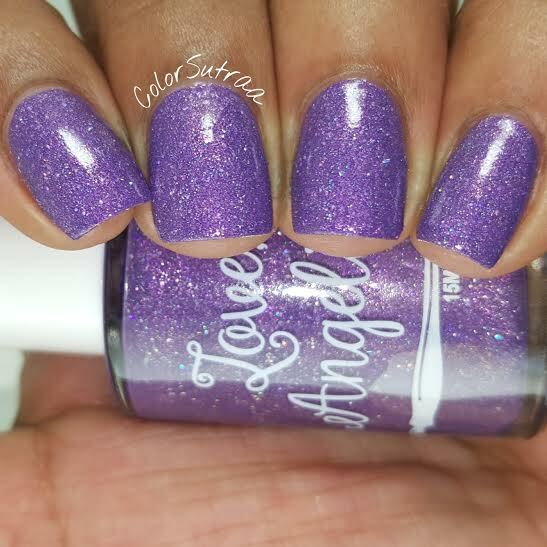 The swatches below show 3 thin coats topped with 2 generous coats of her Topped with Love topcoat. The results, though, are super pretty and this shade of purple is to die for! 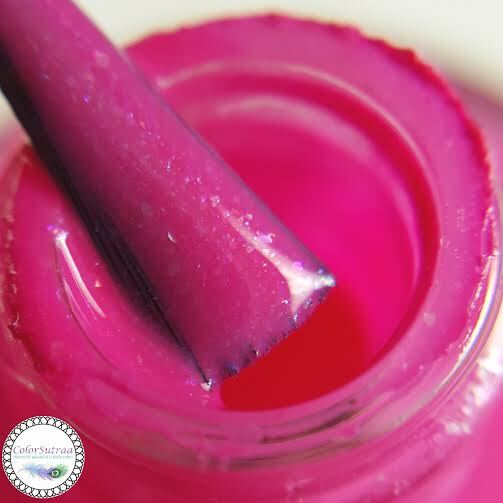 [X'S & OH'S] is described as "a bright pink crelly with rainbow flakies, rose gold micro flakies, and aqua shimmer." 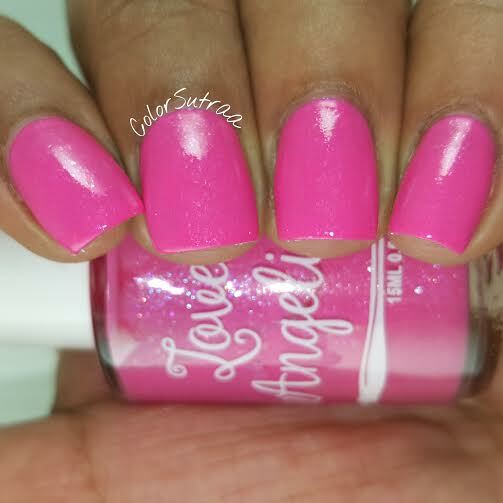 Despite being almost neon I had absolutely no issues with the formula or application--this baby goes on like a breeze. 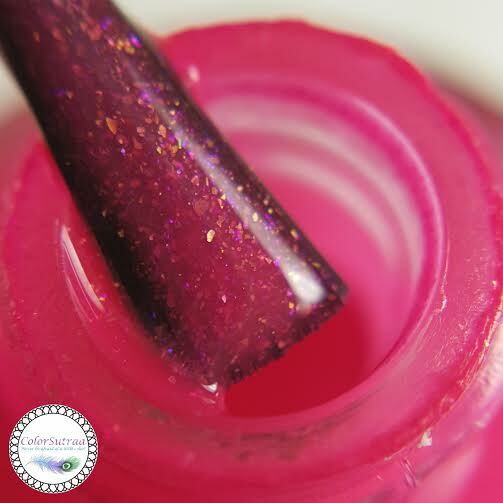 The swatches below show 3 thin coats topped with 1 thin coat of her Topped with Love topcoat. 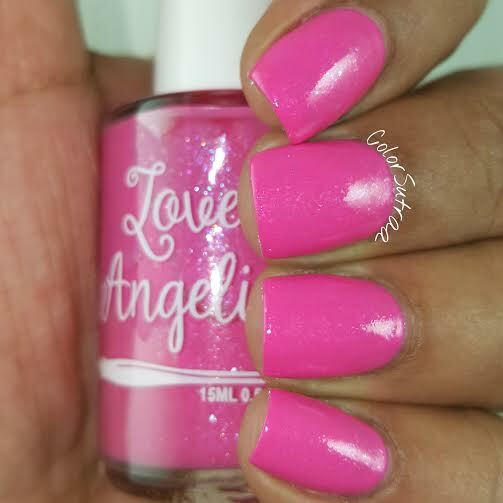 Such a bright, fun pink and that shimmer is even prettier in real life! And I had to see how it looked mattefied with OPI Matte Finish topcoat! 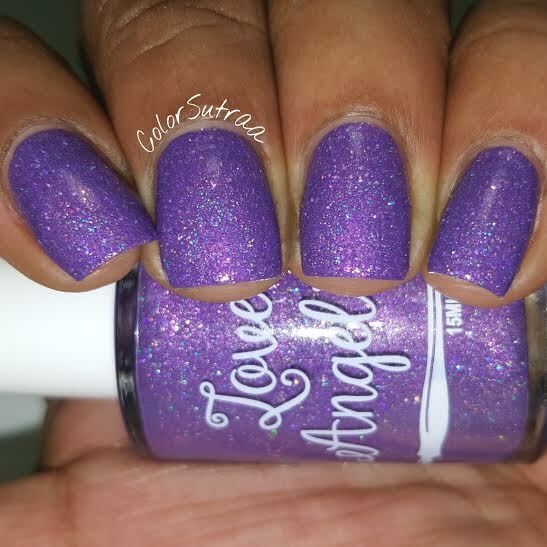 The flakies just pop mattefied! 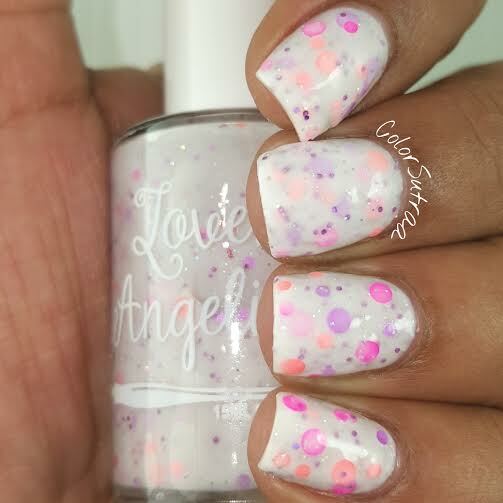 [DOT MY HEART] is described as "a white crelly with neon purple, coral, and pink dots, some pink and silver holo micro glitter." No issues with formula or application and the circle glitters all but leap out of the bottle, as you can see from the profusion of them in the pics below--no tedious fishing needed here! 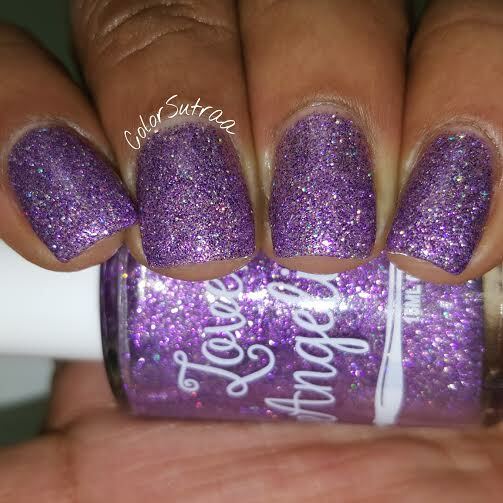 The swatches below show 3 thin coats topped with 2 generous coats of her Topped with Love topcoat. 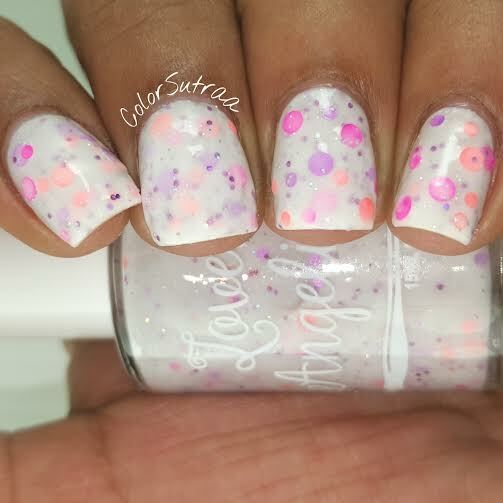 I love circle glitter and this crelly is so beautiful with the bright circles! 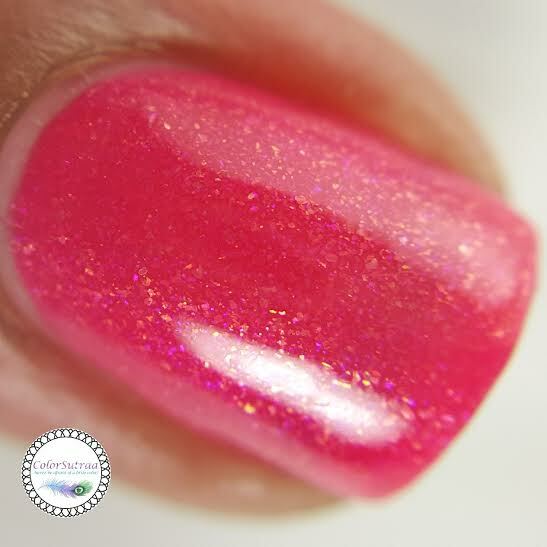 [PUNCH DRUNK] is a described as "a watermelon coral/pink MATTE polish with rose gold and red gold micro flakies." 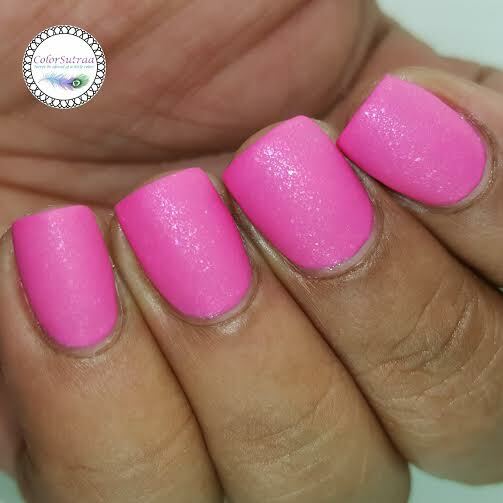 Another almost neon shade with lovely formula and application, Natosha sure knows how to nail these bright shades! 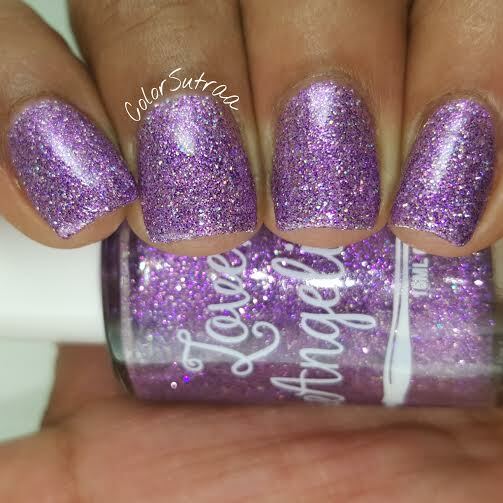 The swatches below show 3 thin coats topped with 1 thin coat of her Topped with Love topcoat. It does indeed dry matte but I wanted to show you all how beautiful it is shiny too! This is one of my faves from this collection! 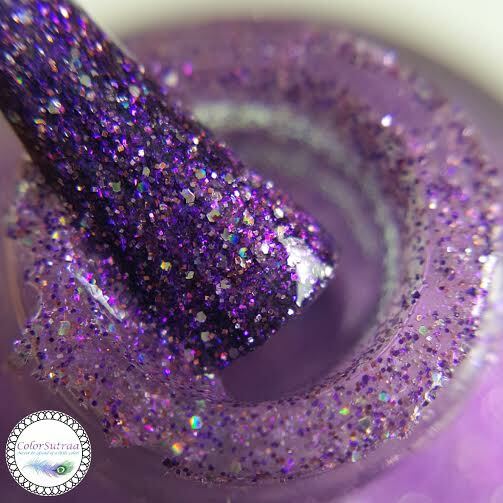 [ROYAL ROMANCE] is described as "a delicious purple holo with shimmer and micro glitters throughout." 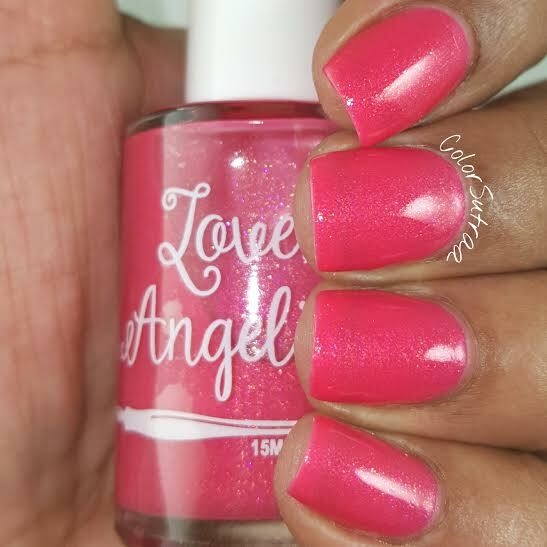 Smooth, easy formula and application--the swatches below show just 2 thin coats topped with 1 generous coat of her Topped with Love topcoat. 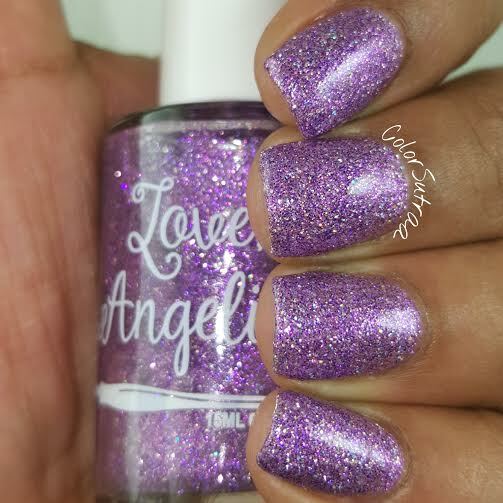 Another instant fave, I love both this shade of purple and the pops of holo throughout this polish! So there you have it, my darlings! 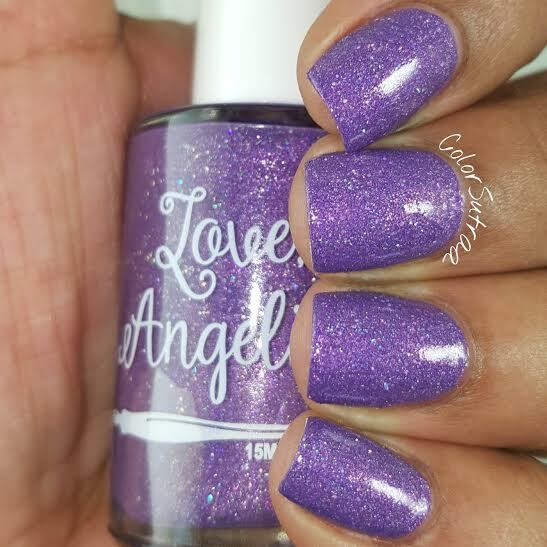 Natosha's 3rd Anniversary collection will be launching tomorrow, February 14th at 9 am MST/11 am EST on Love, Angeline's website HERE. Don't forget to grab your faves! Will you be adding these beauties to your stash tomorrow? Which of these is YOUR favorite? I would love to hear from you in the comments section below! Nice polishes. I think Dot My Heart is my favorite of them. In love with Dot My Heart! Royal Romance is my favorite, it's so complex and has appeal in all types of lighting.